Comedian Eddie Izzard has vowed to return to South Africa and complete his bid to run a marathon every day for almost a month after ''medical complications'' forced him to put the challenge on hold. The comic had finished four of the 27 consecutive 26-mile runs he had planned as a tribute to the 27 years South African president Nelson Mandela spent in prison. 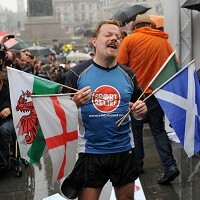 Apologising to fans online, Izzard, who ran 43 marathons in 51 days for Sport Relief in 2009, said ''unforeseen medical complications'' had arisen, triggered by factors including severe terrain, humidity and altitude. Sports travel insurance would be a must for people planning such a gruelling challenge or even less extreme sporting activities. But whether taking part in sporting activities or just relaxing, medical problems can often blight our holidays. To this end, people are advised to take out medical travel insurance.